Because the objective of an arboretum is to grow trees and shrubs for scientific and educational purposes, the Maud Gordon Holmes Arboretum includes many varying species of trees, over 100 shrub beds, and numerous landscape beds featuring vibrant annuals and perennials. The campus displays greenery year-round while marking the seasons with fragrant blossoms, shade-giving trees, and luminous autumn colors. The Arboretum at SUNY Buffalo State was formally dedicated in 1962 with the ceremonial planting of a Scotch elm in honor of Maud Gordon Holmes, founder of the Garden Center Institute of Buffalo. The Friends of the Maud Gordon Holmes Arboretum have made great strides in our campus re-treeing efforts. Check out the Story Map of what trees have been planted! 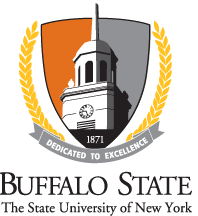 The SUNY Buffalo State campus and Arboretum are in constant flux, changing and growing to suit the needs of the students. Check out the on-going and future projects happening on campus at Facilities Construction & Maintenance.